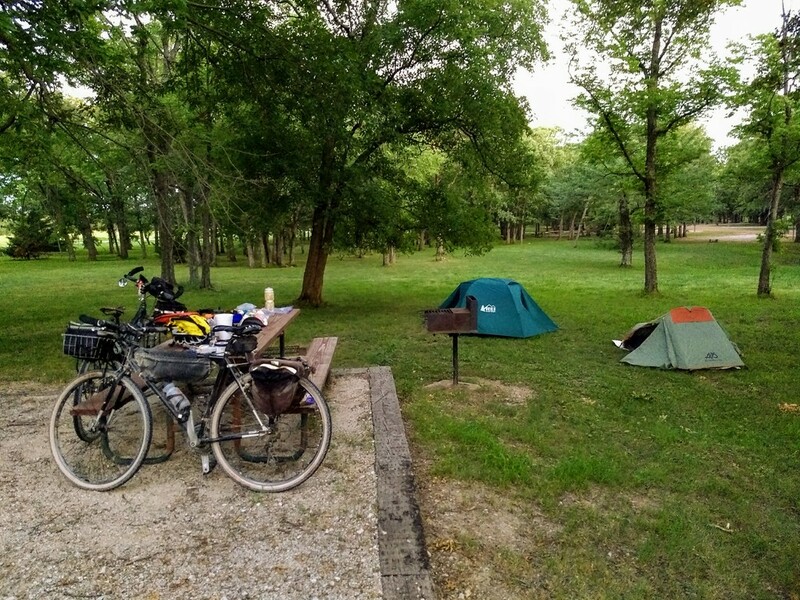 I slipped away for a quick overnight bike camping trip to Cross Timbers State Park in Woodson County, Kansas, along with my friend, Doug. 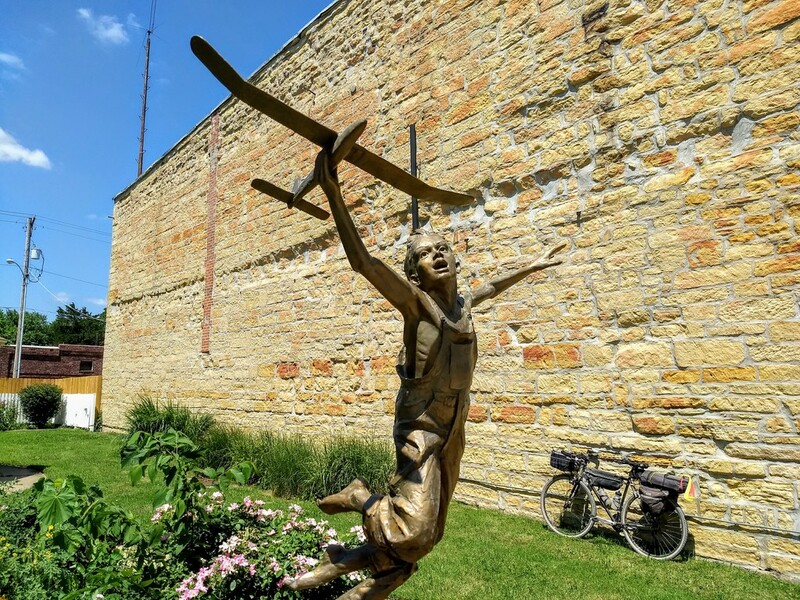 Cross Timbers is a nice distance for a bike overnight, about 45 miles each way, with the option of either pavement all the way (US-54 highway) or gravel roads for most of the distance. We chose the latter. We rolled out of Iola shortly after noon, and enjoyed a nice little tailwind for most of the way. After crossing the Neosho River on the wide shoulders of US-54, we headed north a mile on gravel, then pretty much due west to Yates Center, on dirt and gravel roads for most of the way. After a stop at a lovely little pocket park on the courthouse square, and a late lunch/early dinner at Subway, we hit the gravel roads again, pausing at the iconic Lizard Lips Cafe, before riding through Toronto and on into camp for the night. The next day was pretty much the reverse, except on parallel roads, mostly gravel. The highlight of the return trip was the stop for refreshments in Yates Center, and a break at their city park. The afternoon was heating up quickly, so upon return to Iola we hit up Sonic for ice cream. I rode the Retrospec Amok, in my typical touring configuration (front basket, frame bag, rear rack and panniers), except that for this trip, I swapped out the Axiom Journey rear rack for a lighter Avenir rack, and the heavy waterproof Ortlieb Back-Roller panniers for smaller Nashbar Daytrekker panniers. This worked fine. Enough capacity for an overnight summer trip. If I need more volume for a longer or cooler-weather trip, I can simply use larger panniers. I swapped out to a new set of tires. After the unpleasantness of the ride on my prior tour, running Schwalbe Marathon XR tires, I installed a set of WTB Resolute 700x42s. The Resolutes are advertised as a gravel tire that roll reasonably well on pavement, and this trip bore that out. 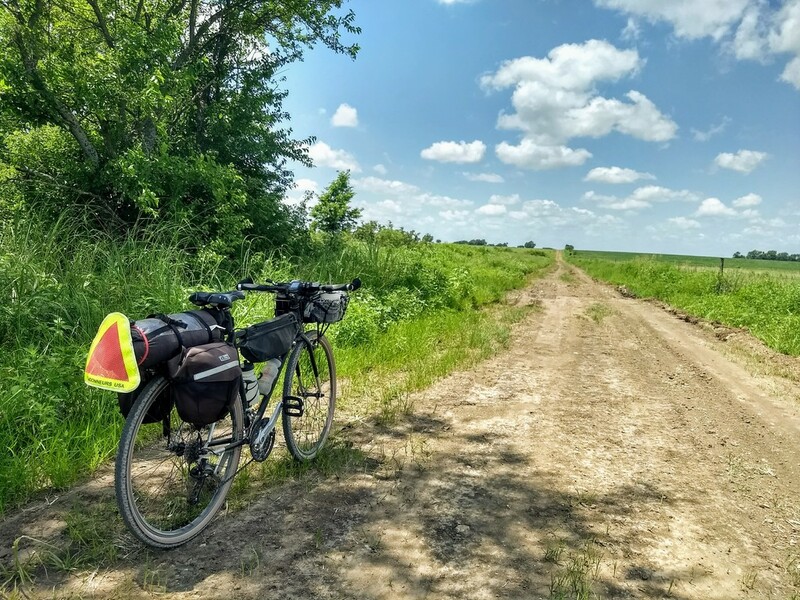 They performed very well on smooth, loose, and rough gravel roads, good on dirt roads, and acceptably on pavement. My rims are not tubeless-ready, so I was running tubes. I expect that setup tubeless, the ride would be even better. Not sure what pressure I was at, but I’m guessing 30-35 front and 35-40 rear. Overall, I was quite impressed. For this trip, I took an inflatable sleeping pad (REI Stratus) rather than a closed-cell foam pad (Therm-a-Rest Z-Lite). I carried it rolled up within the tent bag,and that worked well. Sleeping performance was OK. Not noticeably more comfortable than the foam pad, but OK. I may have a slight leak in the pad, as it seemed much softer by morning. Blowing up the pad (and then getting the air out in the morning) is annoying, compared to the simplicity of the foam pad. Carrying weight is pretty even, though carrying size is obviously much smaller with the air pad. I think I’ll probably go back to the foam pad for future trips. 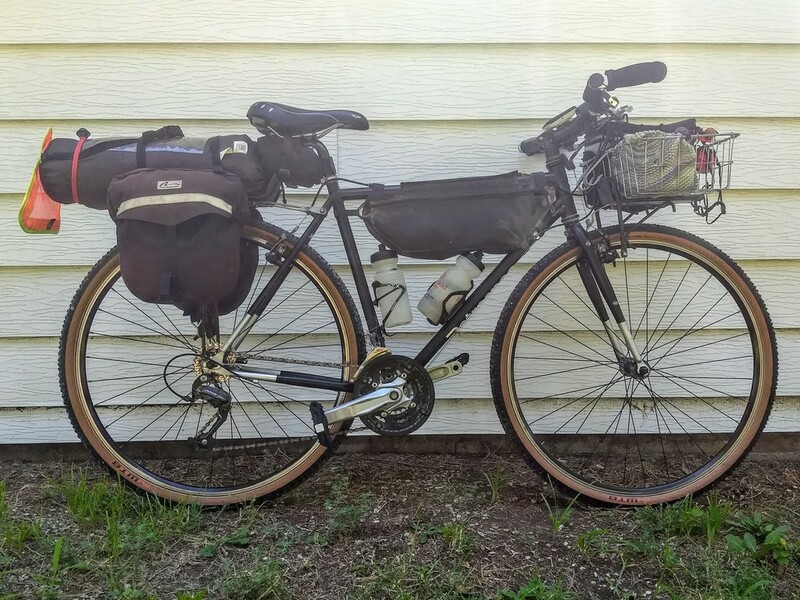 Retrospec Amok with light touring setup, with WTB Resolute gravel tires. The Retrospec on a dirt road in Woodson County, Kansas. Taking a break at a pocket park in Yates Center, Kansas. Camping at Cross Timbers State Park. 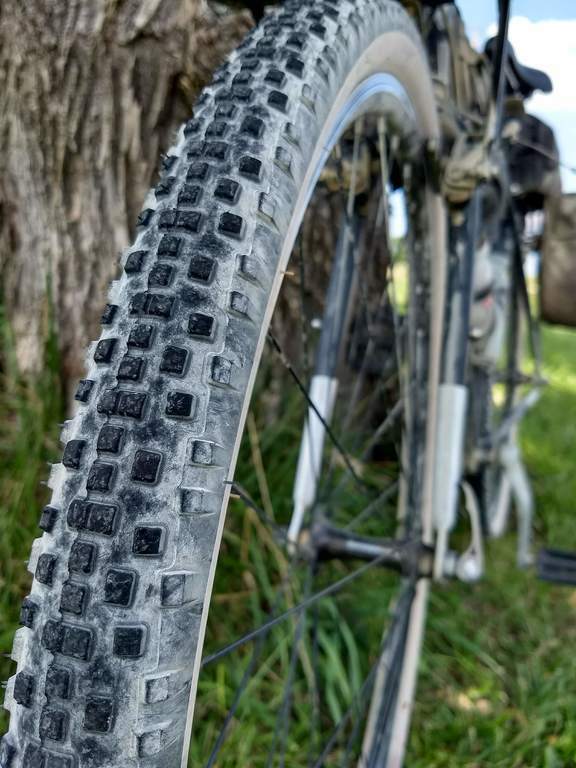 The open knobby burly tread on the WTB Resolute tires.